Late in "Thor: The Dark World," Chris Hemsworth's title character crash-lands on a British Underground platform. He's dazed but knows that he has to get back to fighting Malekith (ex-Doctor Who Christopher Eccleston), a malevolent dark elf. Thor asks for directions back to Greenwich, and promptly boards the train. As the train lurches forward, a woman falls onto his broad chest. He smiles knowingly. This scene is one of several high points in "Thor: The Dark World," a blocky fantasy-adventure whose plot is never as exciting as its characters. All three "Iron Man" films have this same basic problem, but story was never more important than personality in those earlier films. "Thor: The Dark World"'s characters are often very charming, but they're only so much fun when they're stuck going through the motions. "Thor: The Dark World" mostly concerns Malekith's "Transformers"-worthy schemes. Malekith was previously put in his place by Bor, Thor's grandfather, when he tried to turn matter back into anti-matter using Aether, an ancient, all-powerful energy source. 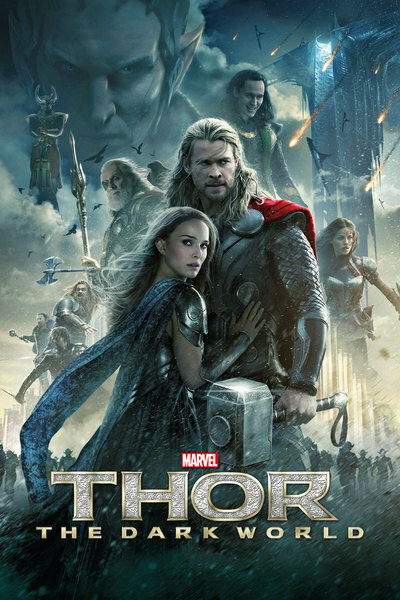 Now, after Jane Foster (Natalie Portman), Thor's super-smart human scientist not-quite-girlfriend, stumbles upon some Aether, Malekith returns. Leading an armada of black splinter-shaped spaceships, he sets out for Asgard, home of Thor and his fellow Norse Gods. But the Asgardians are still recovering from Thor's half-brother Loki's (Tom Hiddleston) recent failed coup. Now, Thor and Loki must team up to save Jane, Earth, Asgard, and the other eight realms of existence from complete annihilation. Malekith may be a major threat to life and the universe as we know it, but he's just one of a handful of characters who are run through their paces in "Thor: The Dark World." This sequel is consistently unfocused in that sense: major characters get to flex their muscles for a scene or two, but only when they're absolutely needed. There are a couple of scenes where characters get to be both important and exciting, like when Kurse (Adewale "Mr. Eko" Akinnuoye-Agbaje), Malekith's super-powered henchman, breaks into Asgard, and starts a prison riot. But there are just as many scenes where inherently exciting characters, like Thor, kill time connecting plot points. Watching Thor make quick work of an inconsequential enemy in an opening scene should be fun. But the scene has no flair to it, and feels like a perfunctory introduction to the character. The first scene in the film where Hemsworth gets to be really charming comes later, when he's squabbling with Hiddleston about operating a commandeered dark-elven space-ship. The squabbling itself isn't that funny, but the scene's pay-off is. Hemsworth's eyes light up as he gets the ship to fly, instantly reminding you why you came in the first place. Still, more often than not, "Thor: The Dark World" is more busy than exciting. There are a couple sub-plots too many, like the one with frequently-naked super-scientist Erik Selvig (Stellan Skarsgard). And too many characters that are introduced with a promising scene, like Rainbow Bridge guardian Heimdall (Idris Elba), are forgotten during the film's climactic battle. The film's world also generally looks slapped together, especially the dark elves, who look like a cross between "Land of the Lost"'s Sleestaks and "Doctor Who"'s Cybermen. Visually, "Thor: The Dark World" is a step back after "Thor," which at least looked unique enough. But in most other respects, "Thor: The Dark World" is a step in the right direction. The scene where Thor enlists Loki's help is a perfect example of the film's slight but memorable improvements. The conversation they have is inconsequential, but watching a defeated Loki surrounded by over-turned furniture and a reddish-brown PG-13 blood-substitute on his prison cell's walls makes the scene worthwhile. Hemsworth and Hiddleston have such good chemistry that it sometimes looks like Thor and Loki will kiss before Thor and Jane will. There's just enough tension and humor in "Thor: The Dark World" to make the film's otherwise listless proceedings worth watching, but only just.